How to Pick the Best Saddle for Your Horse Cont. Picking the right saddle for you and your horse is about as serious as when you were picking out your horse! Read these tips on buying the best saddle for your needs. Withers: The withers of your horse should ideally be level or a little bit above the highest point of its rump, the croup. If it’s lower, or your horse has “meaty” withers, a saddle can more easily slide sideways. Prominent withers presents a different problem. To check the withers, place your hand on edge and slide your fingers between the withers and the gullet. If it’s correctly fitted, you should be able to fit two to four fingers into the space. It is important to test this when you are mounted on your horse as well, so the saddle does not pinch the horse’s withers. Spine and Back: If your horse has a narrow or overly flat back, it can be harder to find the best saddle for it. A sign that will tell you if the saddle is placing weight on your horse’s spine is if there are sweat marks on the saddle where the spine was resting. 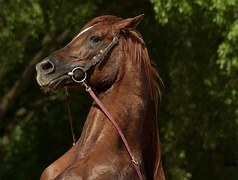 Another concern is placing a saddle on a short-backed horse with long, square skirts that push into the horse’s hips. To learn more facts and tips on horse care and other horse related topics, please refer to our blog often! For high quality horse insurance and other livestock insurance, please trust in the experts at Ark Agency. Give our professional and experienced staff a call at either 320.243.7250 or 800.328.8894.